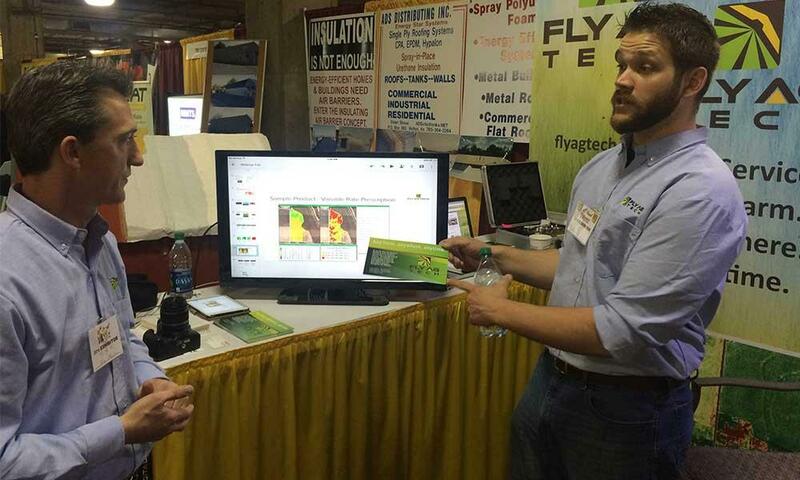 Scott Jackman, left, and Casey Adams, partners in Fly Ag Tech, a precision ag start-up company in Kansas City, show how remote sensing is used to gather information for farmers. The latest tech startup boom today is not coming from California--it’s closer to home. And it involves an industry that’s ancient. Investment in food and agriculture technology startups reached into the billions in 2015, a huge jump from previous years. What’s going on? Peggy Lowe of Harvest Public Media reports that Big Ag has found Big Data. The Western Farm Show is a long way from Silicon Valley. But here in a huge arena, set in what used to be the Kansas City Stockyards, the high-tech future of agriculture is for sale. The centerpiece at this booth is a yellow and white drone – its plastic wings span four feet across. “It’s got a GPS, so it knows where it’s at, underneath here you’ll see an autopilot, it’s an onboard computer,” Casey Adams says. Adams is one of the owners of “Fly Ag Tech,” a brand-new company based in Kansas City. But he’s not selling the drone. What the company is selling is what is driving the ag tech industry today: data. Fly Ag Tech gathers that information by an infrared camera built into the drone, gets an agronomist to analyze it, then offers a prescription for the farmer for better yields. It’s making what’s called “precision agriculture” – yes, that’s really a thing – even more precise. And that’s a big part of the ag tech boom. “We had a segment in our report called 'The Sky’s the Limit for Drones and Robotics,'” says Louisa Burwood-Taylor of AgFunder, an online investment platform for investors. AgFunder released a report in February that showed investment in food and agriculture technology startups reached $4.6 billion – yes, that’s with a B – in 2015. Farmers today already rely on advanced machines, like high-tech combines. This is a new revolution. More Silicon Valley-style, dependent on data and software. 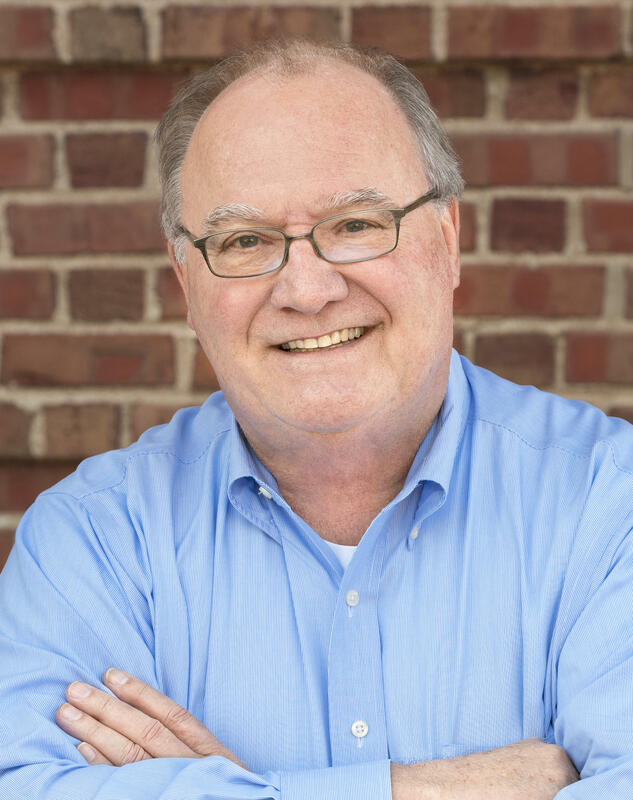 Ron LeMay is the managing director of Open Air Equity Partners and CEO of Farm Link, Kansas City companies. Asked for his reaction to the many companies and investors jumping into ag tech. “My reaction is basically hooray. The country needs a lot of funds going into ag tech,” LeMay says. – Casey Adams, left, and Scott Jackman, partners in Fly Ag Tech, show off their drone at the Western Farm Show in Kansas City. Others in the industry I spoke to called it a chaotic landscape. Small startups are popping up all over, big companies like Monsanto and Syngenta are getting in, and even tech companies are entering the fray. Last year Google’s venture-capital arm dumped $15 million into a network that crunches data on seeds and soil. Back at the Western Farm Show, Jackman smiles as he describes the industry. He’s Casey Adams’ partner in Fly Ag Tech. They’re at this show to meet farmers who’d be interested in their business. But they’re also looking for investors – investors with big pockets who might just be lured into betting on the future of farming. Anyone flying certain unmanned aircraft systems must be registered with the Federal Aviation Administration beginning Saturday. The registration applies to UAS, often called drones, that weigh between .55 and 55 pounds. Any drones heavier than 55 pounds require a separate aircraft registration. Three Kansas schools are teaming up to create a post-secondary degree program focused on using small unmanned aerial systems, or drones, in agriculture. The goal is to improve the technical and analytical skill sets of the next generation of farm managers, technicians and crop advisors. Fort Hayes State University is partnering with Hutchinson Community College and Emporia State University to develop curricula focused on the use of drones in precision agriculture. Industry and business leaders gathered in Wichita Thursday for a summit on unmanned aerial systems, more commonly known as drones. Kansas hopes to be an industry leader in the emerging field of drones, building on its reputation as home to the air capital of the world and the state's technology-driven agricultural sector. At Kansas State University’s campus in Salina, aviation is a big deal. Students can learn how to fly planes and helicopters, or how to manage an airport. They can also study unmanned aircraft, often called drones. The Salina campus is a bit rough on the outside, but impressive on the inside. A number of weather-beaten hangars and unassuming buildings house the latest in aviation technology, including drones.